Prior to streetwear ascending to the height of fashion, and prior to Supreme's cool collaboration with Louis Vuitton and Vetements' luxe $1100 hoodies, all the way back in 1995, Wu Wear was on the scene, Wu Tang Clan's clothing brand, lasting (despite success and some counterfeiting...) until 2008. Jumping into the now, Robert Diggs (aka RZA) and Oliver Grant (Power), 2 of Wu Tang Clan's founders, have grabbed onto a new wave of streetwear momentum, partnering with Live Nation's merch division to relaunch Wu Wear. Available online now, the new incarnation of the brand has reached stores such as Urban Outfitters, readily available for millennials and Gen Z shoppers that likely heard Wu's tracks from parents or older relatives. "As we all know — Wu Tang is forever" - RZA, quoting the group's 1997 album title Wu-Tang Forever. "This line will represent the original aesthetic and the same purpose as classic Wu Wear, with updated silhouettes and design to reflect current fashion sensibility." The Wu Wear reboot is also timed to the 25th anniversary of the group's debut studio album, 36 Chambers, released in 1993. It's a unisex line, consisting of fleece jackets, graphic long-sleeve t-shirts, short sleeves and crew-neck sweaters. Many of the shirts and hoodies are embedded with the iconic Wu Tang Clan "W". Also present, is a throwback '90s vibe which Rihanna, Chance the Rapper and director Eli Roth have been wearing over the last month. Rihanna posted an image of herself on Instagram wearing a black Wu Wear sweatshirt with the word "forever" printed on one sleeve. Her caption: "for.eva." RZA, who has branched out into composing soundtracks for film as well as acting and directing, will continue to be at the design helm of the Wu Wear brand. "As the abbot of Wu Wear, all avenues of the brand are bounced by me for input — inspiration, design and bodies — everything. I review with my partners in Wu Wear and we come up with freshest collection," he says. Power has been brought on to serve as the brand's "historic creative consultant." 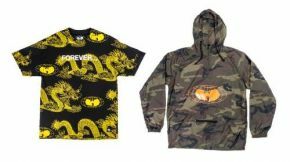 Wu Wear's 2017 holiday collection ranges from $27-$75 and is available at wuwear.com.